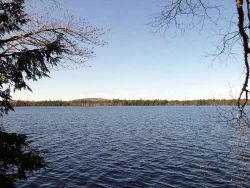 Trescott township, Maine Vacation real estate for sale - This one-of-a-kind property boasts incredible views of the Atlantic Ocean from your very own PRIVATELY OWNED Downeast Maine bold coast land.! The 91 acres (comprised of two adjacent waterfront parcels), and the beautiful cedar log cabin built on it in 1995, are being offered for sale two different ways: the 47 acre parcel on which the cabin sits, with 400' of waterfront, or the entire 91 acre parcel, with 800' of waterfront. The cabin is really lovely, four-season, and move-in ready, with spectacular views of the Atlantic. One could also consider living there while building a spectacular waterfront home on the property. Watch the seals, whales and sea birds, or climb down your own rocks to touch the ocean and admire the sea life in the tidal pools below. This one-of-a-kind property boasts incredible views of the Atlantic Ocean from your very own PRIVATELY OWNED Downeast Maine bold coast land.! The 91 acres (comprised of two adjacent waterfront parcels), and the beautiful cedar log cabin built on it in 1995, are being offered for sale two different ways: the 47 acre parcel on which the cabin sits, with 400' of waterfront, or the entire 91 acre parcel, with 800' of waterfront. The cabin is really lovely, four-season, and move-in ready, with spectacular views of the Atlantic. One could also consider living there while building a spectacular waterfront home on the property. Watch the seals, whales and sea birds, or climb down your own rocks to touch the ocean and admire the sea life in the tidal pools below. Parcel 1: The 47 acres of pine woods and meadows, with the perfect all-wood cabin sitting atop the highest point on the property, about 1/6 mile from the water with spectacular views of sea and sky. Immaculately maintained (two bedroom, 1.5 bath and full loft) all-cedar wood cabin nestled in gorgeous pine woods of Downeast Maine including over 400 feet of private, bold coast, ocean front property. Very private. Cabin is about 1250 square feet and immaculately and lovingly maintained. Asking $475K. MLS # 1110264. Parcel 2: Own 44 more acres immediately adjacent to Parcel 1 with an additional 400' of ocean front in the most beautiful and natural setting on earth! Price provided upon request. Great for peace and relaxation. Free & Clear in Fee Simple. No liens. Running water (well) with brand new UV light purification system. Full electric (wired to town). With additional propane heater for winter. Septic. About 90 minutes from Acadia National Park. Take the ferry to Grand Manan Island. Short drive to Nova Scotia, Prince Edward Island, & Quebec.